Only 4 ingredients to make these popsicles. 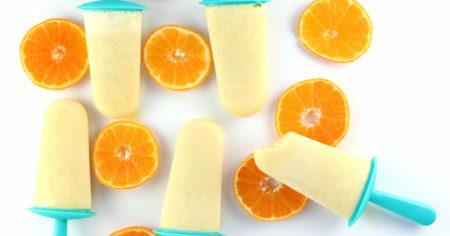 The perfect orange cream summer treat and they are actually pretty healthy too! Toss all the ingredients in a blender and blend for a few seconds to combine. Alternatively, you could just whisk the ingredients together in a bowl, but I like the blender because it makes it easy to the pour mixture straight into the popsicle molds. Pour the mixture into the popsicle molds and insert the popsicle sticker. Freeze for about 4 hours or until ready to serve. Run warm water over the mold to help release a popsicle when you are ready to enjoy your frosty treat.